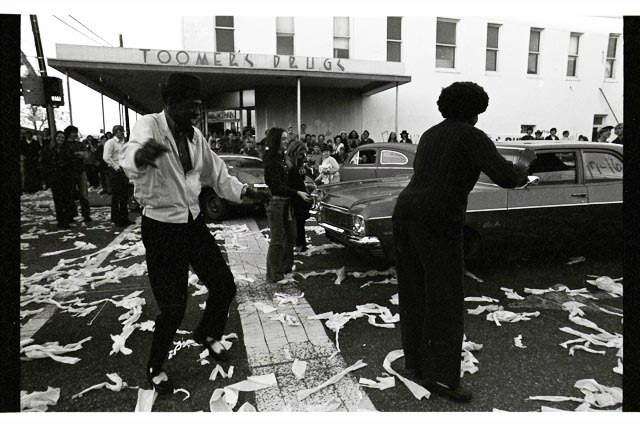 Exactly one year ago today, we posted two galleries: one with photos taken around Auburn the day before the 1972 Iron Bowl, the other with photos taken in Birmingham at the game. 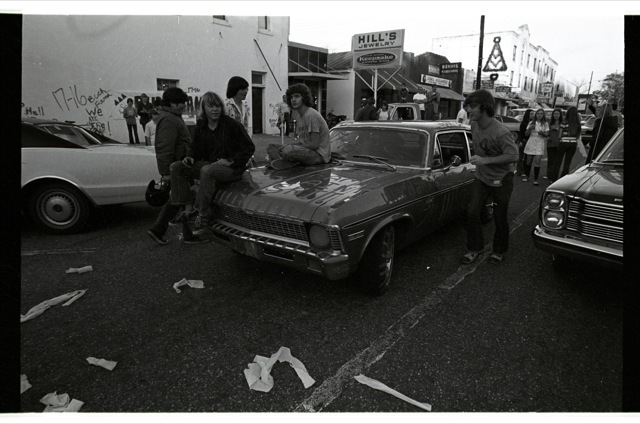 … for they give all indication that the stories you hear… folks dancing in the street, cars legally grafiti’d with “Bama Ain’t S%@#”, Greyhounds full of through-traffic yankees marooned by revelers and rocked by “War Eagles”, “17-16″s everywhere (including the hulls of Casablanca steamships), teens with “Buck Fama” scrawled on their corduroys… are all true. Buck Fama. War Damn Eagle. Related: Never-before-seen COLOR photos of Toomer’s Corner after Punt, Bama, Punt. I was there at Toomer’s after the game…. what a scene! War Eagle! That was back in the “old” days when traffic lights were strung across intersections….. at one point the TP was so thick you couldn’t see through it…. and the poor people caught in traffic trying to get through Auburn just had to sit and wait it out! Auburn people in Atmore, Ala., my hometown, even painted their car windows and hung signs on their homes. I was 8 years old. At that time, it was one of the greatest moments of my life. Until Bo and Co. added some new moments, I recall hearing the radio call over and over and over and over at J&M. It never got old. 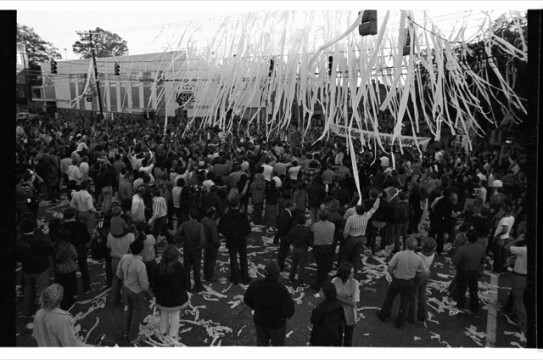 I miss the powerlines at Toomer’s Corner. The current traffic light poles are almost impossible to roll by comparison. Ah, my freshman year! I was in the band, so we didn’t get back to Toomer’s Corner from the game until after 8, but the party was still going on!! And I got rid of that blasted Rat Cap!!! I was 17 and went to the game that year — tickets on the 50 yard line! We painted tiger paws on my car and a big tiger tail across the back of the car with the words “Kiss My Tiger Tail” on it. After the game, an Alabama fan driving a new Corvette let me in front of him – then rammed the back of my vehicle where it said kiss my tiger tail. I had to go home with the rear of the car smashed in & then tell my stepfather that his car had been damaged. For once, I was not in trouble…he told that story over & over in Auburn and got a huge laugh from everyone. A red and white Trailways bus got caught in the height of the celebration. The people on the bus didn’t understand what was happening and had that “deer in the headlight” look. The bus was red and white on one side of the intersection, but was blue and orange when it finally reached the other side. CathyG, the more things change the more they stay the same. 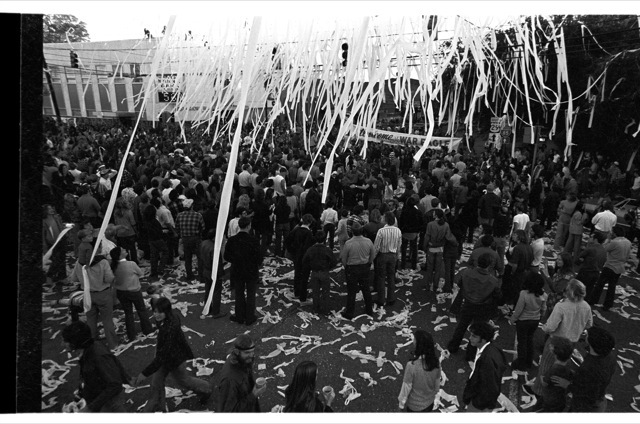 WHen I was at Auburn, I went to the 1987 “Lawyer reverse” Iron Bowl (first and only Iron Bowl I have attended). While we were in line to pull out of where we parked (which appeared to be the churchyard of a little church a few blocks from Legion Field), We saw this Bama fan in his car just keep ramming into the back of an AU fans car over and over and over again (both looked like students, and the AU fellow looked like he didn’t know what to do except to keep moving and get out of there as soon as he could). I was dumbfounded that anything like that could actually happen. I am glad to see that I wasn’t hallucinating this event or something. I was in Legion Field that day, consoling my 17 year old future wife that a field goal to make it 16-3 was really a good thing, that we still had a chance…. Keep your cool, play defense and be ready to make it happen…. That worked for us in 2010, too…. i still have that 45. i was only 6 in ’72. my dad let me swipe it from him. its all warped now but it still plays. I was at the game that day. 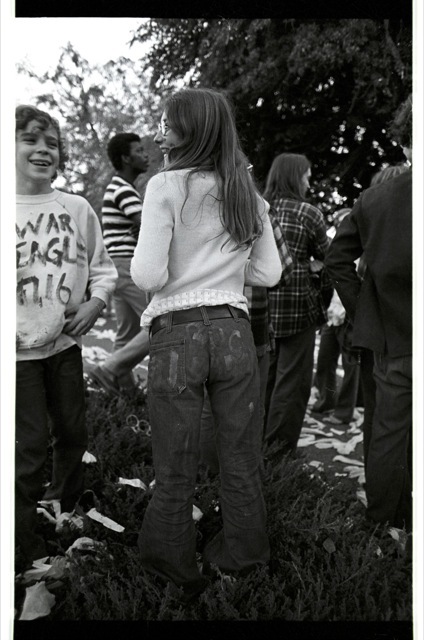 I was a Junior at Auburn, and it was my birthday, December 2nd. I remember how the Auburn fans booed when we kicked a field goal to make it 16-3. Auburn could not get anything going the whole game, It looked very bleak for Auburn until all the action happened. Then everything was ok after that. Punt Bama Punt!!! War Eagle!!! Is there anywhere to buy these pictures? Remember it well: having to trust that Shug had the plan settling for the field goal when we were down 16-0. He did! What a celebration! 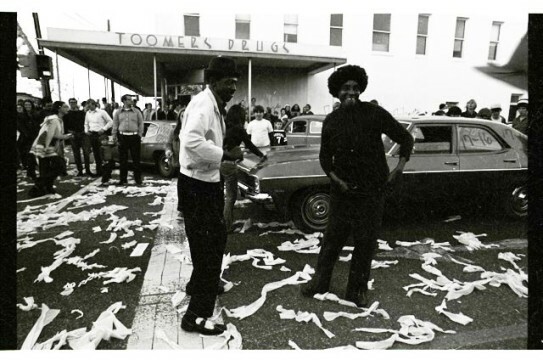 Was in the band, and Doc & Johnnie did the “funky chicken” n the wall at the stadium. 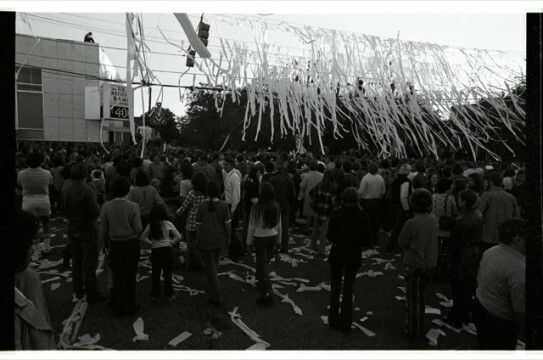 Yes, Toomer’s Corner was still ecstatic and we jumped right in. Oh, what a night! 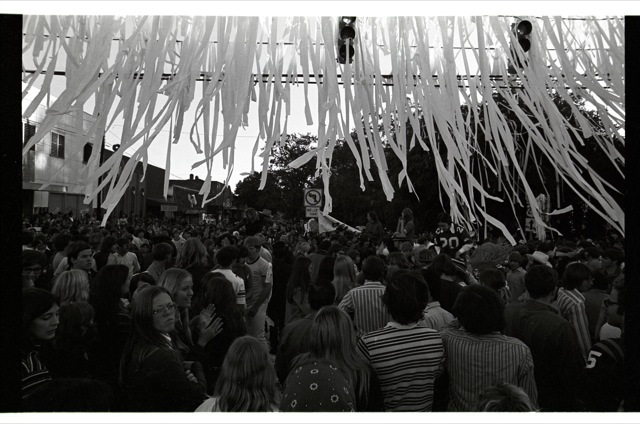 War Eagle… Punt, Bama, Punt! My dad had the same record. When I was growing up (80’s and 90’s), we would listen to it together before EVERY Auburn game. Once I got to Auburn for my freshman year (1996), I would call home on gamedays and he would put it on. Pretty awesome memory.